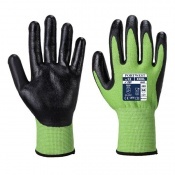 Despite its highly impressive mechanical resistance properties, the Portwest Sabre Dexterous Cut-Resistant HPPE Glove A655 offers exceptional dexterity and sensitivity. The HPPE and steel fibre liner ensures strength, while the comfort of the inner polyester liner makes the glove ideal for handling sharp materials such as knives. 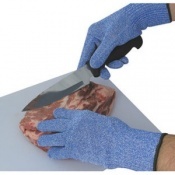 The Portwest Sabre Cut-Resistant HPPE Glove is perfect for use in the kitchen as it offers the maximum cut resistance level, high dexterity and suitability for use with food. 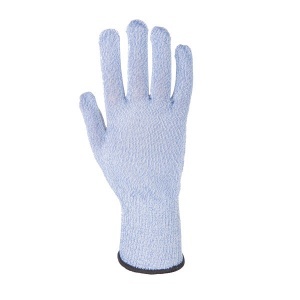 Its thin but sensitive HPPE and steel fibre liner ensures excellent handling abilities with sharp materials, meaning that the user can use knives and kitchen utensils safely. 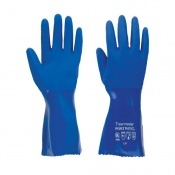 The Portwest HPPE Glove is available in four sizes that should be suitable for most users. To find the perfect glove, please measure the circumference and length of your palm and match the results to the table below.